Makita is back with another 12V rotary hammer and this time it’s sporting a brushless motor. 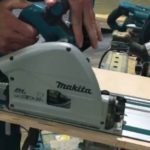 You didn’t know Makita previously had a 12V rotary hammer? Well neither did I until I did some investigating and found out they did back in the day with their earlier 12V cordless line that used ni-mh batteries. Anyways, Makita’s newest 12V rotary hammer is part of the newly released CXT line with slide pack batteries that look very similar to their 18V LXT batteries. 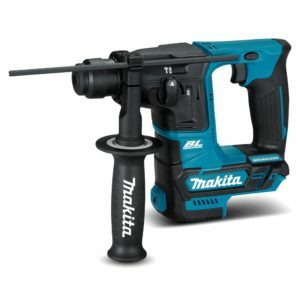 The new Makita model looks to be aimed at competing directly against Milwaukee’s M12 Fuel rotary hammer as it has similar specs with a brushless motor and a 16mm concrete capacity that translates to about 5/8 inches. Makita’s brushless 12V model also has a 2 mode selector for hammer + drilling and drilling only. It lacks the hammer only chipping mode which the Milwaukee also lacks since these 12V models don’t have enough oomph for chipping but they serve very well for hammer drilling. Makita’s model brings in something the M12 Fuel model lacks which is a side handle and depth rod. Not sure why Milwaukee skipped both of these important items. You also get an LED light on Makita’s model which is something that’s appearing more and more on new tools today. So far this new Makita 12V CXT was spotted over in Australia. No word on when or if this model will make it’s way here to the USA but I feel we have a good chance we’ll see this here soon. Nice! Cool to see you were able to see one in person. I also have the M12 version Fuel model. I like it just don’t know why they didn’t include a side handle. I have to borrow the one from the M18 model. Either way good to see Makita did with theirs. Mine is the brushed M12 and it came with a side handle, although I never use it as I find it gets in the way. 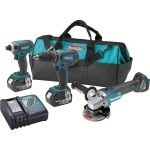 Have to say that I was very impressed with all the Makita CXT tools I checked out. Lets hope they come out with a few more goodies like a bandsaw, a rotary tool and perhaps a 140-150mm circular saw? I have also read on another forum that there are going to be some new 12v jigaws later in the year. Have you heard anything about these? and I agree a larger 12V circular saw would be great to compete with the M12 fuel model. Thanks Javier, we do have that one available here albeit under a different part number. Just have to wait and see I suppose! I have used it now a few more times and I am rally impressed with it. It definitely drills way quicker than my M12 and is not far off being as quick as some of the smaller 18v rotary hammers. Really nicely balanced and just nice to use.